It began as a good news story of collaboration between Aborigines and European settlers…. The Bunting Dale story primarily concerns race relations during the contact period in the European settlement of Victoria. Wherever the British flag was raised upon the land of indigenous people in the world, the story of exploitation and dispossession is depressingly similar. So begins the preface of Heather Le Griffon’s Campfires at the Cross, which is an account of the Bunting Dale Aboriginal Mission at Birregurra, near Colac 1838 – 1851. Victoria was not yet a state in its own right, but remained part of New South Wales. The English missionaries Hurst, Tuckfield and Orton recorded valuable eyewitness accounts of historical drama as Europeans entered the estates of Aboriginal Australians who had held them for 40,000 years. The Colonial Government in Sydney operated as an equal partner with the Wesleyan Methodist Missionary Society in England to select, finance and maintain the Mission. Important decisions made in London or Sydney regarding the problems of racial conflict, frontier expansion and regulation were confounded by cumbersome communication and sparse personnel. Months of delay ensured that crises were never properly addressed. The missionaries fought their battles for justice and equality before the law, together with a passionate plea for Aboriginal land rights. They were interpreters for the Aborigines in Court cases where the missionaries witnessed first hand the racism, injustice and ineptitude of the British legal system to fulfil the noble promises of British citizenship. The Colonial world was a small one. Many of the well-known figures of the era such as Superintendent Charles La Trobe, John Batman, William Buckley, Dr Alexander Thompson, Captain Foster Fyans, Aboriginal Protectors Robinson and Sievewright & Dr. J.D. Lang all feature in the story. Most of them visited Bunting Dale to view the Great Experiment. Through the influence of the Mission in their midst, the local settlers petitioned the Government to reserve suitable portions of land for Aboriginal groups within the territorial limits of the respective clans. They generously responded to appeals for donation of stock, money and goods for the Mission. Gradually, there became a certain pride that the Mission existed in the district. Every European neighbour of the Mission, without exception, willingly signed a further petition to the Wesleyan authorities in an effort to continue its operations when it was threatened with closure, the local Gulidjan clan also gathered to hold their own protest meeting, determined to retain the Mission lands. The fragile success of their claim for Mission land did not endure due to the intervention of other factors. Heather Le Griffon has lived and worked as a secondary school teacher near Bunting Dale. The lack of an accessible, reliable account of the Mission prompted her to write one. She set out to write a local tale but soon discovered its national and international breadth and importance. Although there was some activity by squatters from the mid 1830s, the first real white settlement in the Birregurra area was the establishment in 1839 of the Buntingdale Mission Station, some four miles upstream on the Barwon River from the site of the present township. The Mission was operated by the Wesleyan Missionary Society, a London-based organisation promoting Christian knowledge in foreign parts. It was named after the English preacher, Reverend Jabez Bunting. It was visited in 1841 by Protector of Aborigines, George Robinson, who amused the inhabitants with a fireworks display. The Mission was run by the Reverend Francis Tuckfield and its location was carefully chosen to be at the junction of three or four tribal territories. It soon became clear however that the Coladjins were resentful because the missionaries were welcoming their enemies and the journeys the Aborigines were compelled to make to reach the Mission brought smaller tribes into contact with more aggressive rivals. Feuds flared continually, lives were lost and the Aborigines eventually resumed their nomadic existence. Numbers continued to fall as many succumbed to Eurpoean diseases and some to poisoned sheep and flour. Despite Tuckfield’s enlightened devotion, the Mission made little progress. Land was let and stock numbers built up with the help of local settlers. Captain Bowden was among those employed as an overseer and the present town site became known as Bowden’s Point in 1850s before it became known as Birregurra. 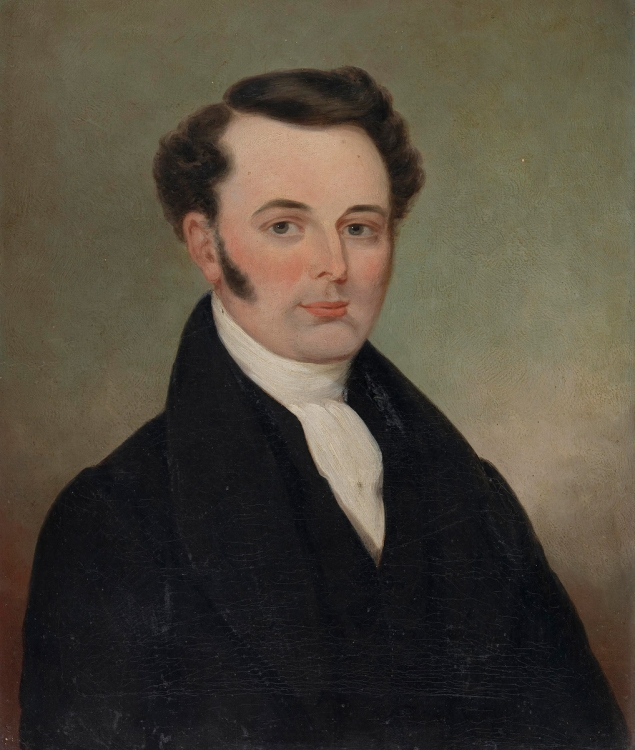 In 1848 the stock was sold, Reverend Tuckfield left for Geelong and the land was subdivided and sold in 1851. In that same year the Mission buildings were destroyed in the ‘Black Thursday’ bush fires. The only reminders of the Mission today are its bell, which is held inside Christ Church, Birregurra, and a memorial cairn in the grounds of the McLennan Memorial Uniting Church. The site of the Mission is on private land and is not accessible to the public. The fascinating story of Francis Tuckfield’s Bunting Dale Mission near Birregurra in western Victoria in the mid 1800s. An unusually enlightened treatment of aboriginals by Wesleyan missionaries..
Cover design in Photoshop. Maps prepared in Macromedia Freehand. Published by Australian Scholarly Publishing, Melbourne, 2006. I have been tracing my heritage for many years and only of late have found my heritage, which I am so proud of. I traced back to Bunting Dale Mission. My forefather was there as much as I can research and he went to Tuckfield School, which was set up for Aborigines, he later became a native policeman then a stonemason. If it was not for my grandmother telling me and my cousins, I would not know where I was from. After searching for so long always coming to dead ends until recently I found my heritage, which has now filled a hole in my spirit. I am so lucky my Grand Mother passed on her story to me because it explains so much about me, and my love for the land we step upon as well as our people. I have so much to learn and little time to pass on to my daughter who has taken up our culture and is passing it onto her children. She works in our culture ensuring and family values live on in the future. I do hope to hear from you I want so much to know about our people and their stories so I can pass them onto my grand children before I pass. My name is Ron Bunting ,and yes I am a direct decedent of the Rev Dr Jabez Bunting who was my 3 times great grandfather .There are also two small settlements in South Africa named after him. Even though Jabez had 7 Children ,there are not too many of us Buntings,as compared with other branches of my Family. Thanks for this interesting Article which i will pass on to the rest of the family. ← Our Spring 2014 Issue is Here!